Pedestal Plate with Praying Mantis Motif. Panama. Macaracas. Period VIB, 800-1000 AD. Ceramic. Gift of William C. and Carol W. Thibadeau. 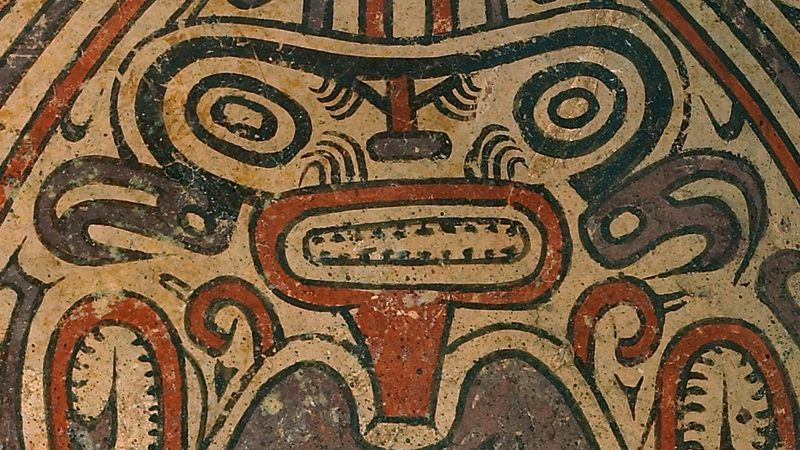 A purple slip began to appear on Panamanian pottery of the Coclé region around 500 AD. The coloration of this slip is unusual because most purple slips in the Americas are more maroon. The production technology of these Panamanian ceramics has been little studied, and many uninformed statements have been made about the identification of the purple slip. Former Andrew W. Mellon Assistant Conservator Kathryn Etre studied the technology of these ceramics to identify the firing temperature of these ceramics and the mineral of the purple slip. This presentation describes the use of various analytical techniques, including polarized light microscopy, x-ray diffraction, and x-ray florescence to characterize the minerals within these ceramics. Additionally, experimental archaeology was used to recreate this ceramic production technology.